I tried a couple recipes I found online before I hit on fiddling with an AllRecipes one to get a close approximation to what I longed for. The secret is cocoa powder rather than actual melted chocolate. The former provides a deep chocolatey, almost Cocoa Puff-like flavor, without weighing down the airy puffed kernels, which is what melted chocolate, unfortunately, does. Anyone can make this. Just pop some fresh popcorn. Then, heat together cocoa powder, butter, corn syrup, sugar, vanilla extract and a dash of salt. Take it off the heat, and stir in a smidge of baking soda, which will aerate the mixture. Then pour it over the popcorn and stir to combine quickly. Then, bake the coated popcorn in the oven for about an hour to help coat the popcorn even more and add even more crispiness. Let cool completely, then dig in. I dare you to not eat handful after handful after handful. 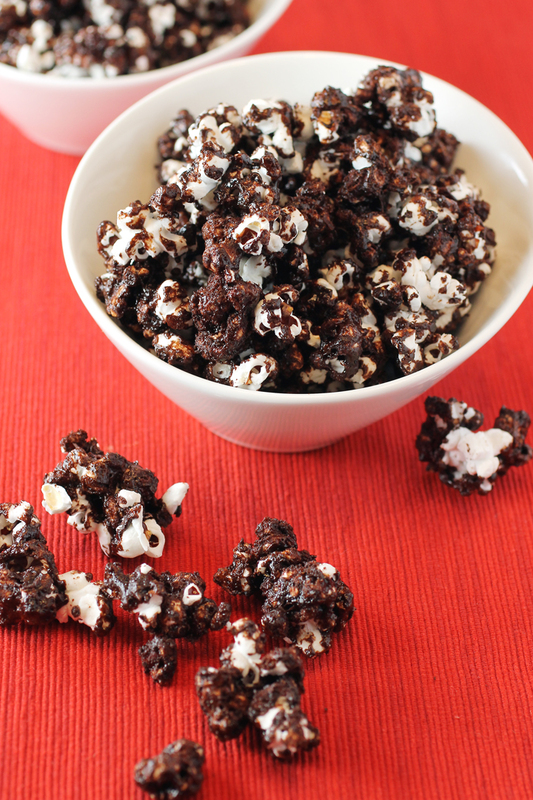 Store in a tightly covered container and the chocolate popcorn will stay crisp for more than a week. Well, if you don’t inhale it all immediately, which is a real possibility. Make some this Valentine’s Day. It’s one of the sweetest ways to show some love. Put some in a cute little tin or in a cellophane bag tied with a red ribbon for gift-giving. Well, if you can bring yourself to part with any. Pop the popcorn kernels. An easy way is to just heat a large skillet over medium heat. Add 1 tablespoon of neutral oil such as canola, then the kernels. Cover with a lid. When you start to hear the kernels begin to pop, shake the pan regularly to help distribute the kernels. Continue doing this until the popping has ceased. Transfer popcorn to a large bowl, and set aside. Lightly grease a rimmed baking sheet with the 1 tablespoon softend butter. Set aside. In a small saucepan over medium heat, add the 4 tablespoons butter. When melted, stir in the cocoa powder. Next, add sugar and corn syrup, stirring until combined. Add vanilla extract, then turn the heat up to medium-high. Let the mixture boil for 2 minutes. Then, remove the pot from the heat, and stir in the salt and the baking soda. The mixture will foam up slightly. Pour it over the popcorn, and quickly stir to coat evenly. 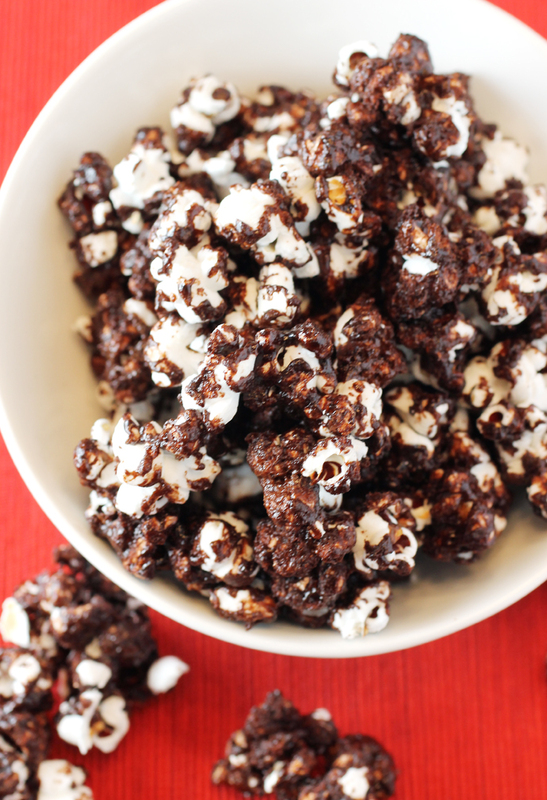 Transfer chocolate-coated popcorn to the prepared baking sheet, distributing it in an even layer. Bake for 1 hour in the oven, giving the mixture a stir every 15 minutes. 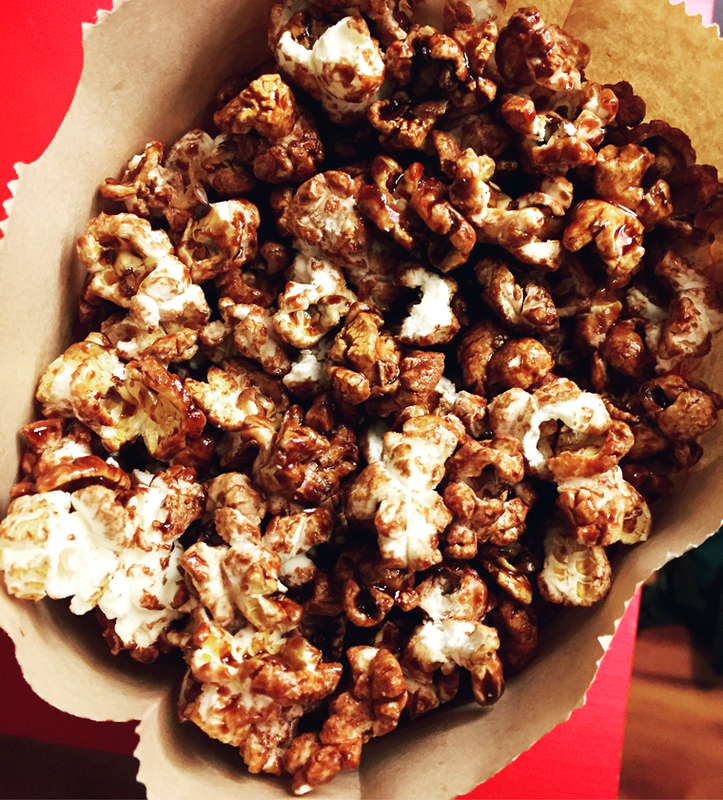 Let popcorn cool enough so you can break it up into small pieces with your fingers. Store in an airtight container. Was just thinking about what to make for my Dad’s 89th birthday. Done, delicious, thank you! The epitome of rich, sweet & salty goodness! 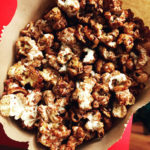 i love making and eating caramel popcorn, but i hadn’t even considered a chocolate version! yum!! !